Yet another Killer Application released for MorphOS. Digital finite impulse response filters have never been so much fun. Just today one of the most acknowledged and revered MorphOS programmers released yet another killer application. Its name: DigiFilter. Its purpose: To design digital finite impulse response filters. Hot on the heels from such greats as Chocolate Castle, DigiFilter brings a whole new digital dimension of digital filtery stuff to MorphOS. We just had to meet in person to congratulate Krashan, the lead programmer of this very promising project. He addressed us, telling us some of the implementation secrets behind his work. "The design is performed with well known windowing technique," and indeed, microseconds after starting the program it opens a familiar looking object: a window. We were amazed. "We expect 90% of all morphos users to be very busy with this program for the next couple of weeks," Krashan added with a faint glint in his eyes. And he did not promise too much. Just right after the release of this program, which we think will help MorphOS to advance in reputation and be taken more seriously, a reduced chat count in all MorphOS specific IRC channels and a general reduction in internet usage was to be noticed. After extensive hours of playing around with this little gem we came to the conclusion that the program name might be a bit misleading as the program resembles quite much the connected line drawing and curve drawing features which we all know from drawing programs such as PPaint and the like. And indeed, we mainly used it to create raw previews of very expensive line drawing experiments that we were going to execute in PPaint, but, of course DigiFilter does it all in a fraction of the time it would take in PPaint. hours before its official release, we got very typical answers like "Sounds like a tool I must have immediatelly [sic]" or "Interesting util" and "Would never have come up with it". Krashan's success builds upon that of JacaDcaps, who was rewarded for enforcing simple refresh in MorphOS by an all expenses paid, one way trip to Antarctica. MorphZone users are already speculating what kind of reward to give Krashan's efforts, with possible holiday destinations like Beirut, Afghanistan and Iraq being considered. In conclusion we have to say THUMBS UP for the great effort put into DigiFilter, and for the great effort from the fans for praising such a great effort. The future looks brighter than ever. I've written DigiFilter because I needed it personally. I could just store it in some dusty corner of my harddisk. I've preferred to give it some GUI and make it available to anyone for free instead. If you do not like it, or are not educated enough to know its purpose, just don't use it. This comment matches another one on amiga-news.de, where someone accuses me for giving up ezTCP bounty and writing useless applications like DigiFilter. Very encouraging for hobby programmer, which I am. Some words about 'killer app'. Why don't you write here about thrilling SDL games being throwed into Aminet every day? Every such a game does circles around DigiFilter, advanced graphics, amazing 3D effects, clever DMA usage, free hidden spyware in powersdl.library and more. And for the end, I have really bad news for you. 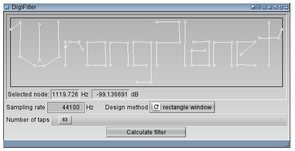 I have a rodamap for DigiFilter, there are four releases planned, codenamed as 1.1, 1.2, 1.3 and 2.0. Stay tuned. the author of DigiFilter and more useless software. "free hidden spyware in sdl library"